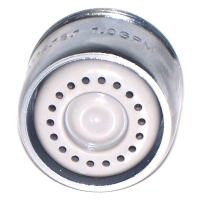 This low flow water sensed labeled, chrome-plated faucet aerator delivers instant water savings. It's High Pressure needle spray allows you to clean very effectively with a minimal amount of water. It is a needle spray dual thread aerator with a water flow of 1.0 gallons per minute. Switching to this aerator from a 2.2 gpm aerator can deliver huge water savings - 13,140 gallons of water annually! Saves 55% more water and energy then a standard 2.2 GPM aerator – that’s 13,140 gallons of water annually!